PRODUCT DESCRIPTION: Round sphere, just larger than a golf ball, which is hung on plants which apple maggots target as host plants. Before hanging, a coat of included glue is applied to the sphere and then the food based lure is attached. Once hung, apple maggot adults will smell the lure, fly to the trap and get stuck on the glue. WHERE TO USE IT: Though generally used on apple trees, this trap can be set on any type of berry or fruit plant or tree which might be targeted by apple maggots. 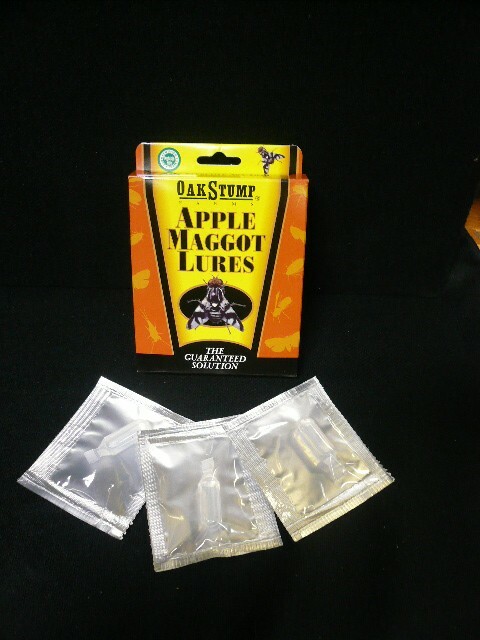 Since there are many species of apple maggots that have learned to live off fruit other than just apples, the use of this lure should be considered when growing anything that might produce sweet produce or fruit in areas where apple maggots are active. RATE OF APPLICATION: At least one trap per plant is generally adequate. The scented lure will remain active for 30-60 days; the glue will remain active for at least as long. 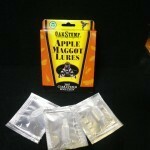 We just received the Apple Maggot Traps and were impressed with the instructions and packaging.